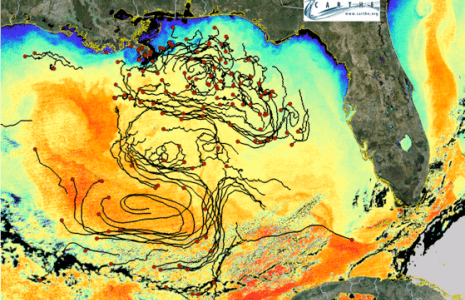 Drifters deployed into the Gulf of Mexico sent location information back to scientists through a GPS satellite. Some of the 5.7 million data points about the drifters locations are seen in this map of the Gulf. The Gulf oil spill is recognized as the worst oil spill in U.S. history. Within days of the April 20, 2010 explosion and sinking of the Deepwater Horizon oil rig in the Gulf of Mexico that killed 11 people, underwater cameras revealed the BP pipe was leaking oil and gas on the ocean floor about 42 miles off the coast of Louisiana. By the time the well was capped on July 15, 2010 (87 days later), an estimated 4.9 million barrels of oil had leaked into the Gulf. One Response to "Gulf Oil Spill"